1. 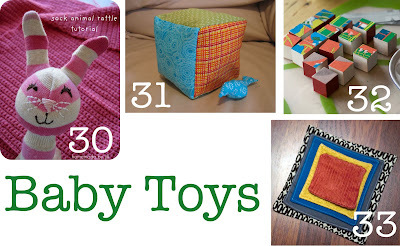 If you didn't get a chance to check out all of the Baby Week projects or you just want to see them again, I have a list of them on my sidebar. Just click the link matching the picture to visit the post again! These guest authors deserve lots of props! Stop by their blogs and say hello! 2. 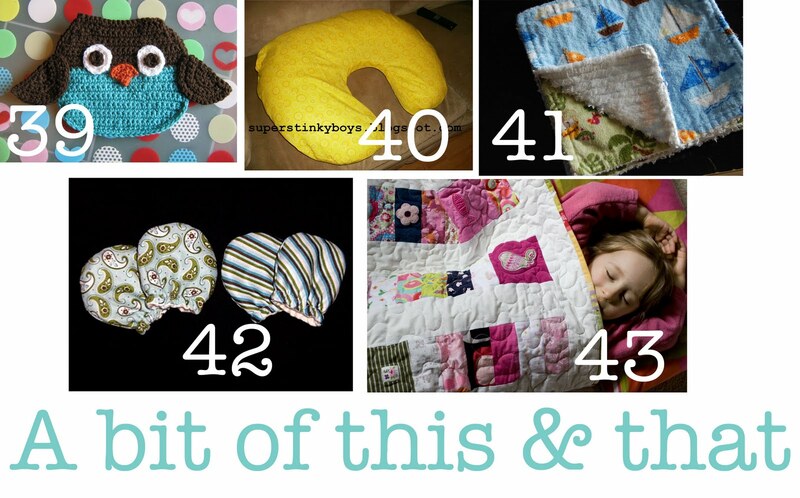 We have a winner of our first giveaway--My very own giveaway for the "Baby Is Sleeping" sign. Congrats, Amberlyn!! I can't wait to send you your little baby girl sign! E-mail me at oopsey(dot)daisy(at)yahoo(dot)com by Tuesday. I just need your address! 3. Now let's end Baby Week with YOUR ideas! 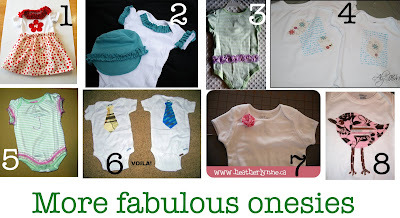 Here is one last roundup of fabulous baby ideas. 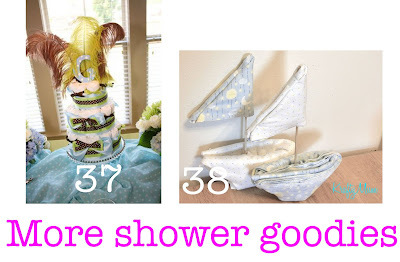 Most of these are from our very own Baby Week linky party. There were additions to our link list up until today, so I wanted to feature these, too! I found a few more ideas I liked, too! So here you go! ENJOY! 1. Embellished onesies from Creations by Kara. 2. Adorable baby set from At Second Street. 3. Flower ruffle onesie from MInt & Clandy Create. 4. Stamped onesies from Aly & Ash. 5. Monogrammed onesie by Anything That Glitters. 6. Tie onesies from Yours, Mine, and Ours. 7. Fabric flower onesie from Heather Lynne. 8. Appliqued onesie from Just Sew Sassy. 9. 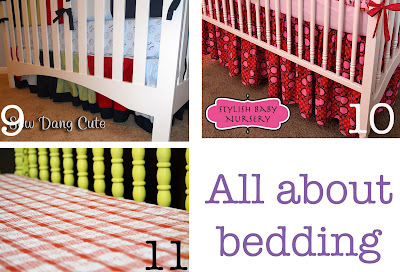 Bed skirt tutorial from Sew Dang Cute. 10. Nursery bed ruffle by Sew 4 Home. 11. 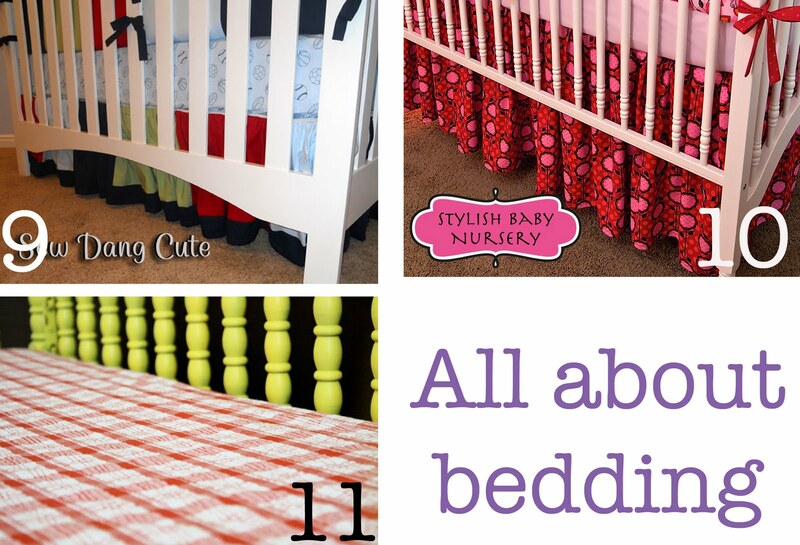 Crib sheets from Made (via Luvin the Mommyhood). 12. Scrappy nursery pillow by Mother Lode. This is a new blog I found--absolutely adore it! 13. Nursery window coverings by Mother Lode. 14. Initial frame from The Two Savvy Sisters. 15. Baby board book shelf from Mother Lode. 16. Nursery frames by Feathers In Our Nest. 17. Fabric birds from Feathers In Our Nest. 18. 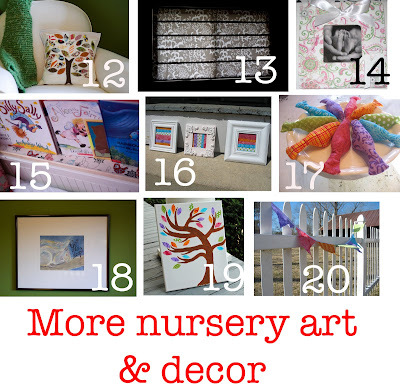 FREE baby nursery art from Mother Lode. 19. 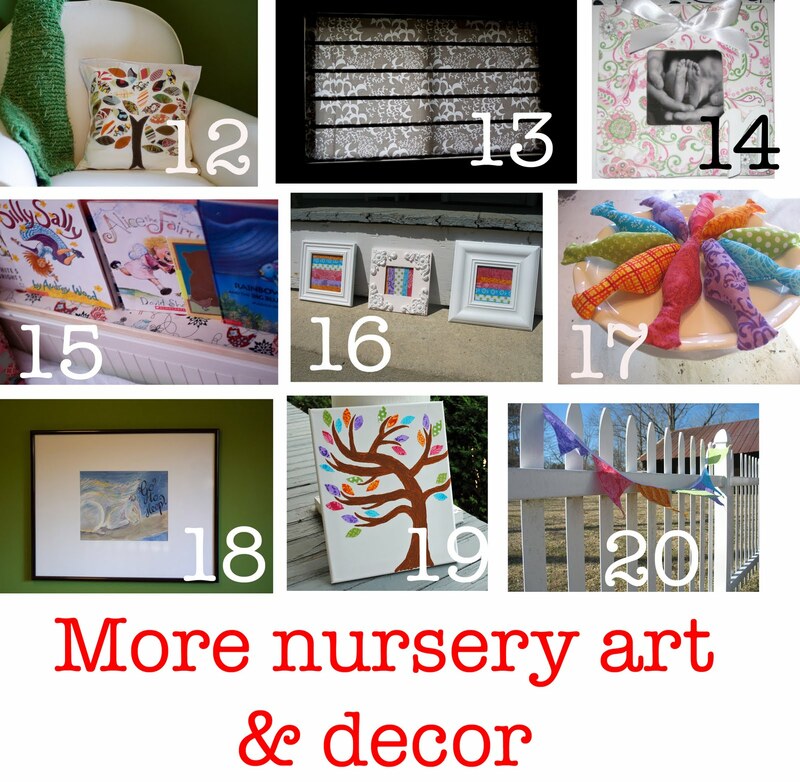 Nursery wall art from Feathers In Our Nest. 20. Baby bunting banner by Feathers In Our Nest. 21. 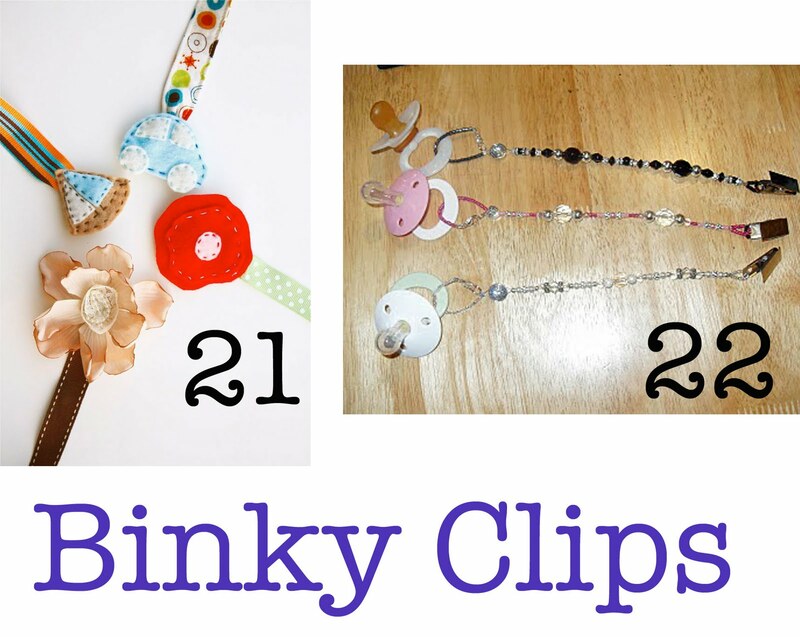 Pacifier clips by Ruffles and Stuff. 22. Beaded binky clips from Sumo's Sweet Stuff. 23. 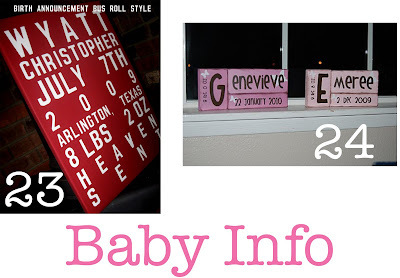 Baby announcement canvas by Geezes Custom Canvas Art. 24. Baby blocks from Naptime Crafts. 25. Baby felt shoes from Issa Sarza. 26. Petal toes from How Does She? 27. Fired up baby shoes from Pony Tails & Fish Scales. 28. Gathered clutch from Noodleheads. 29. Diaper clutch by Fowl Single File. 30. Sock animal rattle from Homemade By Jill. 31. Cloth cubes from Feathers In our Nest. 32. Storybook puzzle blocks from Mother Lode. 33. Nesting velcro baby squares by Mother Lode. CUTE idea! 34. Double layered pillow case dress from Seamingly Smitten. 35. 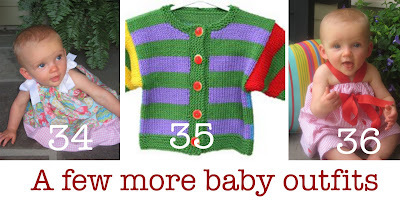 Baby sweaters by Inside the Yellow House. 36. Red seersucker halter top and capri outfit from Seamingly Smitten. 37. Adorable pickles & ice cream shower by Anything That Glitters. 38. Baby shower sail boats from Krafty Mum. 39. Amazing crocheted owl bib by Fowl SIngle File. 40. Boppy from Super Stinky Boys. 41. Washcloths from It's All In My Head. 42. Baby scratch mittens by Home Sweet Homebodies. 43. This is such a cool idea!! Baby clothes turned into a big girl quilt from Mother Lode. PS Don't forget to enter Knits & Reads' amazing baby bootie giveaway by tonight at midnight!! You've highlighted some really GREAT stuff here! Thanks for featuring my Yellow House Knits sweaters! Thank you so much for featuring me! There have been so many great ideas showcased this week. 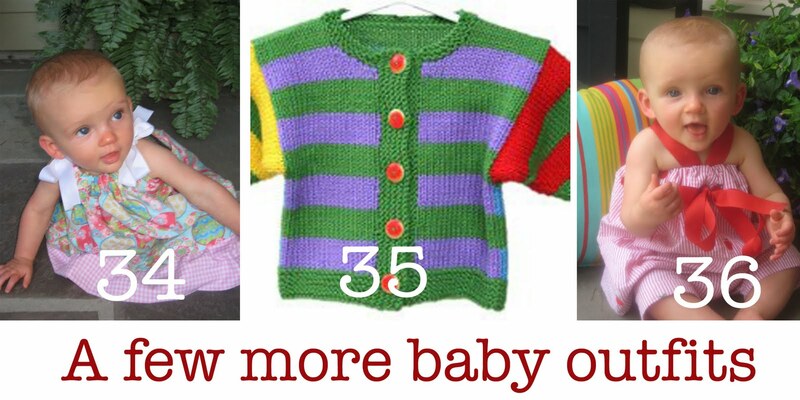 I have loved sharing and receiving so many great ideas in Oopsey Daisy's baby week. Thank you so much for featuring me – such flattery, and always fun to make new blogging friends. I'm a fan and look forward to more posts and fun gatherings on your fun and fabulous blog! Thanks so much for featuring my posts! I'm definitely going to bookmark all of these awesome baby ideas! Thanks!!! Thank you so much for featuring my artwork. There are wonderful baby ideas!! Lots and lots of great ideas posted here! I am definitely going to have to try some of the projects (and learn more about making baby food- something I have never tried!). Thanks for the feature!